Herpetology students from the University of Georgia (UGA) recently visited the Orianne Indigo Snake Preserve (OISP) and an adjoining landowner’s conservation property. In less than 48 hours, the students encountered 31 species, making for a memorable trip. More importantly, students experienced how conservation-minded landowners work with the state and nonprofit organizations to restore and manage native ecosystems and wildlife. The trip started on a Thursday evening when the students joined UGA Professor Dr. John Maerz and Orianne scientists Kevin Stohlgren, Dirk Stevenson and Dr. Stephen Spear to explore a pond on the preserve. Barking Tree Frogs were immediately obvious by their distinctive call. For many students, this was their first experience with these charismatic frog species. Little Grass Frogs—Georgia’s smallest frogs—were also calling from shrubs along the bank. Other exciting discoveries from the first night included Ornate Chorus Frog tadpoles and an American Alligator. The next morning, Dirk Stevenson and Kevin Stohlgren led the class in search of Eastern Indigo Snakes and Eastern Diamondback Rattlesnakes. Dirk explained how most male Indigo Snakes had already dispersed into lower lying areas, but females were still on the sand ridges where they lay eggs. It was rainy, yet fairly warm, and we spread out to search a grassy clearing. Because Indigos use Gopher Tortoise burrows to seek shelter, we searched each Gopher Tortoise burrow we encountered. Within 30 minutes we found a small female. Of course, small for an Indigo Snake is still quite large compared to most snakes found in Georgia. Despite their impressive size and incredible strength, Indigo Snakes rarely bite, and this female was remarkably calm. 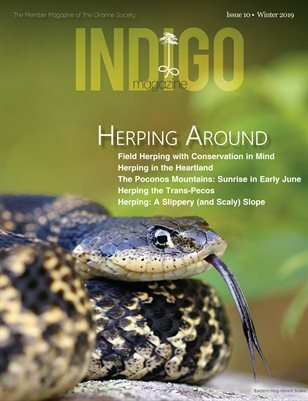 For most of us aspiring wildlife biologists, the opportunity to observe and handle a rare Indigo Snake was a unique and awe-inspiring experience. The group was hungry after a morning of searching for snakes, and the Orianne partner landowners provided a generous homemade lunch for our class. Following our meal, one of them led us on an exploration of his restored Longleaf Pine habitat. “This land has been in my family for seven generations.” He went on to share his passion for restoring the Longleaf Pine ecosystem and its unique plants and animals. He described some of the challenges associated with restoring the Wiregrass community that characterized the Longleaf savannahs that historically covered much of the southeastern United States. He also explained that working with The Orianne Society and the Natural Resources Conservation Service (NRCS) has helped him create a legacy and preserve an ecosystem and piece of land that means a great deal to his family. While exploring the property, we found a number of interesting and charismatic species, including a pair of Spotted Turtles and tiny Southeastern Crowned Snakes. Over the course of the remaining day, the group encountered many other interesting species, including Gopher Tortoises, an Eastern Coachwhip, and several species of frogs and salamanders. The trip was an ideal opportunity to reinforce the concepts we have been learning in our courses at UGA and demonstrated the power of the type of partnership that The Orianne Society has formed with the Warnell School of Forestry and Natural Resources at UGA. It was also a unique opportunity to meet biologists, learn natural history and see collaborative conservation in action.